Can dads experience postpartum depression? 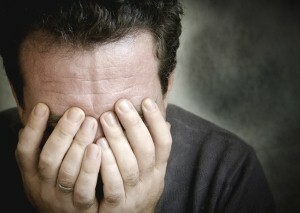 Home » Dad » Can dads experience postpartum depression? You've no doubt heard of the "baby blues," and you may even be experiencing it up close and person if your wife is feeling a little down in the dumps after the arrival of your baby. But did you know that men can suffer from postpartum depression as well? If you haven't been feeling your best, you could be suffering from the very same funky mood that's affecting your wife. Many men are afraid to speak up about their baby blues because they worry that it'll put an undue burden on their wives, or they don't think they're justified in feeling sad. But psychologist James F. Paulson, assistant professor of pediatrics at Eastern Virginia Medical School in Norfolk, Virginia, tells U.S. News and World Report that as many as 10 percent of new dads experience feelings of sadness and despondence after the birth of a child (meanwhile, 14 percent of women report being similarly affected). If you're hit with a bad case of the baby blues, seek professional help to talk about your issues. And don't hide your feelings from your wife – you may think you're doing her a favor by doing this on your own, but leaving her out of the loop could lead to bigger problems later on. Talking about your issues together, as well as with your friends, can help ease the burden and have you back to your old, happy self.